Cooley High (1975). Directed by Michael Schultz, who also directed Car Wash (1976), covered here last month. Here's a link. 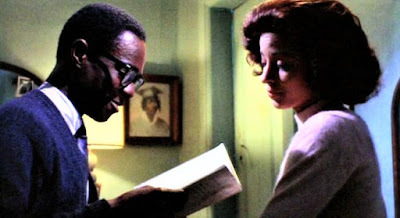 The setting for Cooley High is Chicago in the year 1964. A fairly low-budget film, it was a hit in the mid-1970s, an exciting time for cultural offerings. Scripted by Eric Monte, who also worked on What's Happening!! (which shifted the Cooley High setting to Los Angeles). Main actors include Glynn Turman as Preach, Lawrence Hilton-Jacobs as Cochise, Cynthia Davis as Brenda and Garret Morris as Mr. Mason, a teacher-mentor who looks out for them. Hilton-Jacobs was also in Welcome Back, Kotter, a 1970s series that co-starred John Travolta. Preach shows the initially dubious Brenda that they have a shared interest in poetry. He's got a sort of Thelonius Monk-Dizzy Gillespie-Spike Lee kind of look with those glasses and, when roaming around, his cap. Cooley High isn't all fun and games. There's a sense of mortality hovering in the background, with a couple of poignant drinking salutes to the dead -- a custom with which I am quite familiar. Cooley High is also nicely enriched with a Motown-powered soundtrack.